To start, there is an abundance of poorly conducted studies by people with poor methodology and strong conflicts of interest. And I’m not necessarily talking financial conflicts. I would say most the time these conflicts are intellectual. Intellectual conflicts of interest occur when the person has a deep-seated belief in an idea – they may even have devoted much of their professional lives to that belief. They want it to be true so badly that they unintentionally leave wiggle room for their beliefs to remain (loose controls, statistical manipulation, spinning the results, etc). What it has resulted in is the reality that ANY belief that you can have regarding health and medicine has SOME evidence published in the literature that supports that belief. It allows people to keep on believing whatever they want to believe which was not the goal of EBM. Few people argue that these three things are important, but how they play off each other has created great confusion. The most common analogy that I hear is this idea of the concepts being three equal components. Each component plays the same role in the same way that a stool is held up by three equal legs. The other application I hear all the time is, when a high quality randomized controlled trial (RCT) doesn’t exist, just go with your gut as a professional (clinical expertise) or whatever the patient thinks will work for them (patient values & circumstances)! That’s Not How This Works! That’s Not How Any of This Works!!! It is time to use a really big word here: Epistemology. This has to do with why you believe what you believe. Basically it refers how you process information. Most people don’t actually know their own epistemology. They know what they know because reasons. The scientific method is an epistemology. It uses epistemological principles such as falsifiability, replication, prediction, etc to guide and stay true to the process. This systematic adherence to the principles of the process is what makes it the best tool to acquire objective knowledge about the world around us. 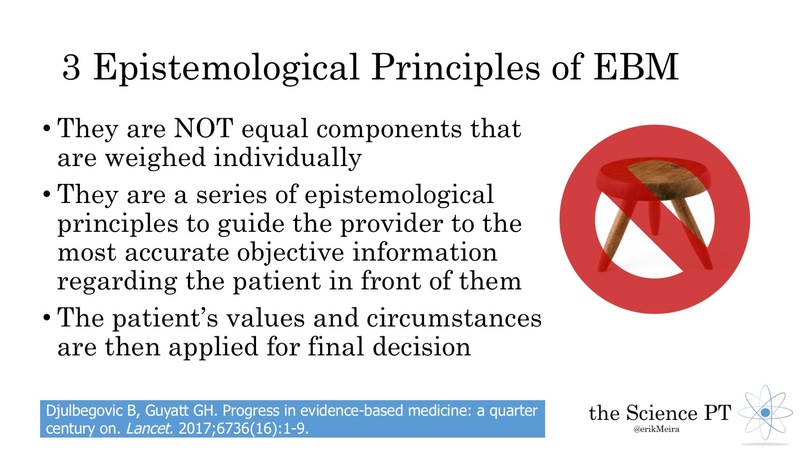 EBM is another epistemology. Those three concepts are NOT equal components that are weighed individually. They are a series of epistemological principles to guide the provider to the most accurate objective information regarding the patient in front of them. The patient’s values and circumstances are then applied for final decision making. I prefer a funnel analogy. Each principle narrows your decision-making process further than the last. 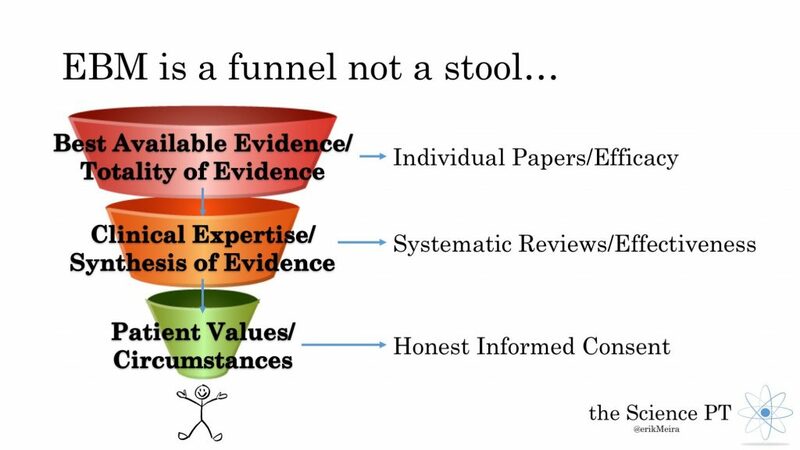 Start at the top and move down the funnel. This is the ENTIRETY of the individual pieces of evidence. That means RCTs (efficacy in particular at this stage), descriptive studies, case studies, population samples, etc. It also means basic science such as physics, chemistry, etc. Also included in this massive pile is what you have seen day to day in the clinic. Here is the key: You consider ALL of it – not just one study or evidence you saw with your own eyes – EVERYTHING. In a perfect world, there would be a massive volume of very specific and narrow studies that do a really good job of answering very targeted questions. This provides the information for the next stage. 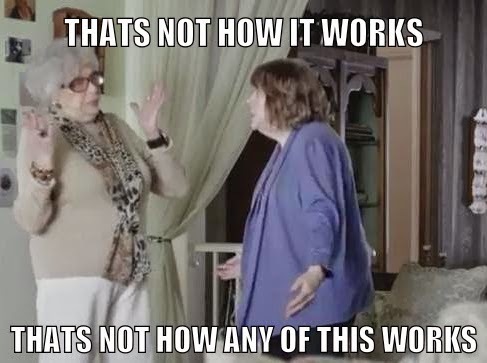 Now that you have all that evidence you must make sense of it collectively. As I mentioned before, you can find evidence to support anything. The goal isn’t to find support for an idea but to find the most accurate understanding. The most accurate understanding will stand up to all of the evidence. Not only does it explain the findings of the RCTs but also the case studies and what you see in the clinic. It also doesn’t contradict the other laws of nature such as physics and chemistry. Ideally there would be high quality systematic reviews that summarize all of this for you already and guide future research. Some have suggested that the failure of the systematic review to consistently do those things is what holds EBM back – I agree. With things like PROSPERO, these reviews are improving but there is still a long way to go. Consider how this all applies to the real world – hopefully there are effectiveness studies to give you an idea. What are all of the pieces of evidence that apply to the patient sitting in front of you? Did you consider the psychological and social issues that may complicate this further? After all of that what are you left with? This is simply honest, informed consent. It is the definition of being patient centered. This is not saying, “Leeches? Sure, we can do leeches!” If you followed the epistemology of EBM, you can’t reasonably end up at leeches as an option that you offer the patient. Further reading: This article by Benjamin Djulbegolvic and Gordan Guyatt is a good update on EBM today.